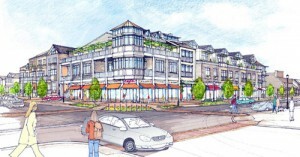 A former brownfield site, this mixed-use development is evolving into a walkable, community-focused area that will serve as a catalyst for the sustainable revitalization of Belmar’s struggling downtown by encouraging the creation of new retail, residential, parking, and public spaces that use state-of-the-art green design practices. Once an unsightly and long-vacant car dealership, 800 Main Street will feature a community-focused, mixed-use project in the heart of Belmar, one block from the train station. The development will offer 38 housing units of various sizes and types, such as flats and townhouses with front porches along the street. Main Street will be enhanced through ground floor retail spaces, generous sidewalks, and shade trees as well as a community pocket park. The required parking (78 shared spaces), which will be shared by residents and shoppers, will be enclosed and covered by a green roof and community garden for residents. The project at 800 Main Street strives to balance increased density with the street’s intimate scale and to integrate well with nearby uses, especially neighboring homes. The development’s architecture draws from and relates to the fabric and history of Belmar while connecting to contemporary styles. Founded as a Victorian shore town in the 1880s, Belmar was once a thriving beach community but, like many other shore towns, eventually lost its draw as a destination. The downtown went through a period of steady decline, and for more than 15 years, residents have been thinking about ways to revive it. This process culminated in the Belmar Seaport Village Redevelopment Plan, which aims to bring new residential and commercial activity to the downtown. In 2005, Belmar began an extensive public outreach process, which included many public meetings, a thorough design charrette process, and presentations, in order to allow residents to analyze opportunities and to evaluate outcomes. As a result of this process, the town devised the unique “Presumptive Redeveloper status,” to ensure that existing business and property owners are given a fair first option to develop their own properties, thus creating a win-win situation for both the property owner and master redeveloper, while mitigating eminent domain issues. In addition to being soundly anchored in the community, the redevelopment plan stands out because it uses innovative design, construction, and financing techniques, such as density bonuses for LEED certification and tax abatements; shared parking; live-work units; and community gardens. It is designed to promote pedestrian activity and reinforce the Transit Village status; enhance Main Street through ground floor retail and streetscapes; expand the borough’s housing supply; and incorporate sustainable design principles. The plan specifies high design standards to establish a sense of place and to reflect Belmar’s character as a seaport village and beach community, while helping it become a sustainable, year-round community. The building at 800 Main Street, which is expected to break ground in the summer of 2007, is the first project within the Belmar Seaport Village Redevelopment Plan to be realized. This bustling mixed-use development will set high standards for the sustainable renaissance of the downtown.